Routine analysis through advanced research methods. The V-730 is an economical, general-purpose instrument with a compact design to save bench space. 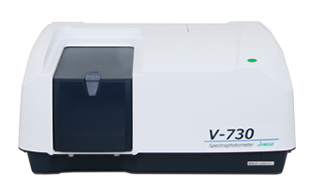 Its excellent spectroscopic performance is suitable for routine, QC and research applications. User friendly features include the IQ Accessory function for automatic accessory recognition and IQ Start for immediate start of registered data collection applications when conducting routine measurements. Two graphical user interfaces are available including a newly redesigned intelligent remote module (iRM) with a color LCD touch screen or Spectra Manager II software, the latest version of JASCO's innovative, cross-platform spectroscopy software. Both of these control and analysis interfaces allow full system control and advanced data processing. Spectra Manager CFR is a 21 CFR part 11 compliant version of software and is available as an option. Both the iRM and Spectra Manager II software offer an intuitive interface allowing even first time users to collect data with confidence. The optical bench of the V-730 is a compact 441 (W) x 468 (D) x 216 (H) mm, saving space in the modern laboratory. A full complement of sampling accessories including cell holders, flow cells, temperature controllers and software packages are available to optimize the V-730 for specific applications. For laboratories compliant with GMP/GLP regulations, the V-730 offers an instrument validation routine (as standard) to verify instrument performance.